Tantrums, trauma and tears were once part of the morning routine for Cleveland mum Tina and her daughters, Danneka and Natasha – both of whom suffer from anxiety and panic attacks. Thankfully, your support means those dark days are becoming distant memories for the family, who have since found solace and solutions through their school chaplain Tanya, and the room at school she calls home – Yanggabarra. “Yanggabarra is a local Quandamooka word, which translates to ‘a safe place to be’,” Chappy Tanya explains. Through consultation with the school’s principal and local elders, Yanggabarra was born. Cleveland State School principal, Mark Ionn, says Yanggabarra and Chappy Tanya offer a safe space for students and families alike. “Students need to identify a range of safe people in our school to connect with at certain times. Chappy Tanya is not only an integral member of our cohesive team, but clearly identified as a key safe person in our school,” he says. For Tina and her daughters, Yanggabarra and Chappy Tanya have been instrumental in bringing healing and success. “My girls have full-on panic attacks and I’m naturally a very fidgety person, so I wasn’t coping,” recalls Tina. Desperate for a breakthrough, Tina found herself lingering outside Yanggabarra one afternoon. “I got the sense she wanted to engage with me, but wasn’t sure. So I struck up a conversation,” says Chappy Tanya. Chappy Tanya invited her and Danneka to take part in an anxiety program she was running together with the school’s guidance officer. Two years on, Tina and Danneka have completed some additional parenting and friendship classes with Tanya, and the change has been profound. “Our home is a much calmer place. Danneka doesn’t have as many panic attacks. She’s so much more mature, which is great to see,” says Tina. 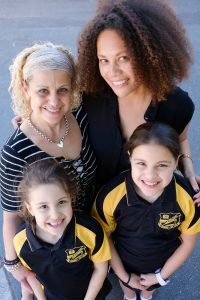 Tina and the girls have embraced Chappy Tanya as an extended part of their family, and are grateful for the presence of chaplaincy in Queensland schools. “I just really appreciate that she’s available for everybody, especially because there’s a lot of full on issues she takes on. But she’s always there,” says Tina. You can help ensure chaplains like Tanya are always available to children and families in need of support. Chappy provide immeasurable value to a community, very sad to see thousands of ACT kids will be denied the support, love and wisdom these beautiful people give.